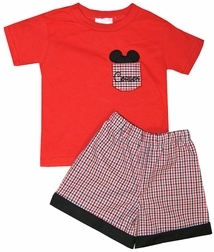 For this sweet outfit, we chose a soft cotton red shirt and either applique a Mickey head in the left pocket area OR make a tri-check gingham pocket to match the trousers and applique the top of Mickey over the pocket. 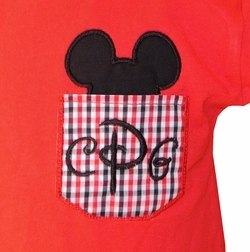 You can choose to add your little one's monogram to the applique/pocket. The shirt is paired with tri-check gingham shorts or pants with black fabric cuffs.